Text engraving is optional and costs £4.00 per engraved product. Magnificent pyramid shape glass award handcrafted in flawless clear optical crystal and Sapphire Blue crystal. 22.5cm tall, offered with engraving and/or colour print options, supplied with black foam lined presentation box. COLOUR branding available - Use Request Quote form, below. A magnificent modern crystal award with an ancient inspiration. These 'Luxor' awards feature a pyramid design, a shape that has symbolised human endeavour and achievement since ancient Egypt. The awards are handcrafted in flawless clear optical crystal and Sapphire Blue crystal. Optical crystal refracts light in a myriad of directions as the award is held and turned, creating a different aspect every time. 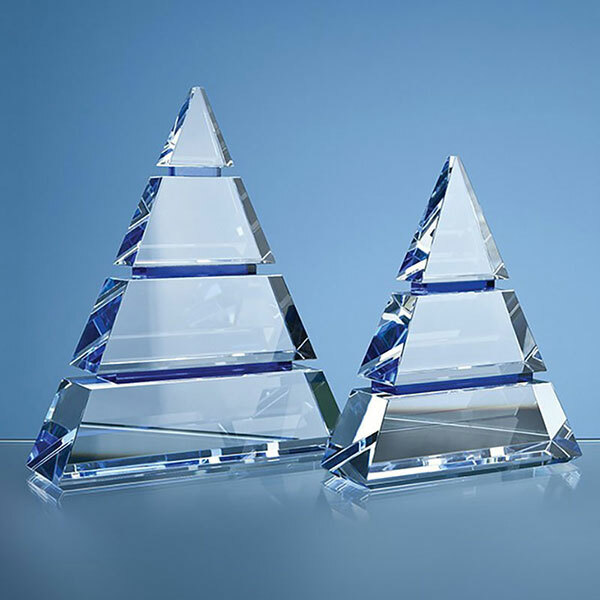 These 22.5cm crystal Luxuor awards can be customised on the flat front of the pyramid design and they are offered here with engraving and/or colour print options. Each award is supplied in a black foam-lined presentation box. Full colour printing is available for many of our glass and optical crystal awards, with fees from as little as £6 per item. Any product suitable for colour branding will show a colour branding option on its page, just click the 'Engraving Options or Colour Branding' button. If you have any questions about colour branding, please Contact Us.